2 medium lebanese cucumbers, chopped. 1/2 cup fresh parsley, finely chopped. 1/2 cup yellow split peas. 1/4 cup fresh mint, finely chopped. 5 to 6 baby eggplants, halved. 1)Brush eggplants with olive oil, place it on backing sheet, back on hot oven (350ْ F),until tender. remove from pan and cut into medium chucks. 2)Combine all ingredients in bowl, mix well, drizzle with dressing. Best made just before serving. 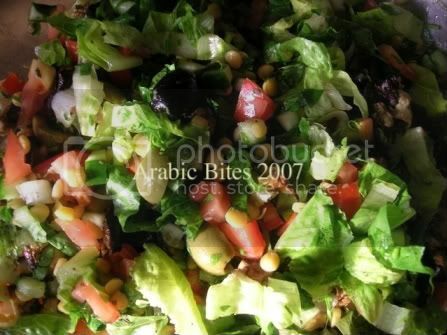 A simple salad, the best kind :) It looks delicious! Love eggplants in any form....salad sounds good with eggplants too! Thank you (gloria,meeso,nabeela)for the comment,we truly appreciate it.